Shimmerz Paints: Our First EVER Sale! How about some fun and exciting news on this fine Tuesday? Shimmerz is updating it's website. It's gonna be all shiny and new and we want to show it off. We are having our FIRST EVER website sale. Did you see that.....yes 30% off your ENTIRE order! Black Friday thru Cyber Monday! So that gives you all weekend to shop. Pick and choose those favorite colors and heck grab some for your scrappy friends for the PERFECT gift! Each purchase made will be entered into a drawing to win a Vibez prize package containing 6 of our HOTTEST Vibez colors! 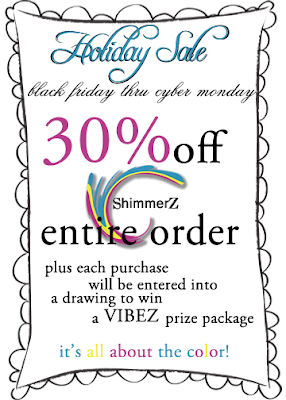 There is NO better time than now to stock up on Shimmerz. Happy Thanksgiving from ALL OF US at Shimmerz Paints!